Every Flickr call needs to have an associated API key. Theoretically I could have bundled my own API key with Photonic, but this presents a challenge: API Rate Limiting. API Rate Limiting is a process by which a service provider (Flickr in this case) puts a limit on how many calls can be made by an application. Flickr caps this at 3600 per hour for free API keys. Given the large number of users of the plugin, if I bundled my key, visitors of your website would start seeing errors as soon as the threshold of 3600 was reached. Photonic is free software in every sense, so I cannot apply for an expensive commercial key. Hence the plugin requires users to specify their own keys. Really, it is that easy! You can insert your galleries into posts or pages with a very simple interface as linked in the documentation above. Go to the Flickr App Garden page. Determine if you require a commercial or non-commercial key, and then click on the link that says “Apply for your key online now“. On the resultant page click on the option applicable to you. You will be brought to a page where you can fill out details of your request. Note the API Key and Secret on this page. The above can be seen from https://www.flickr.com/services/apps/by/your-user-name as well. That’s it! 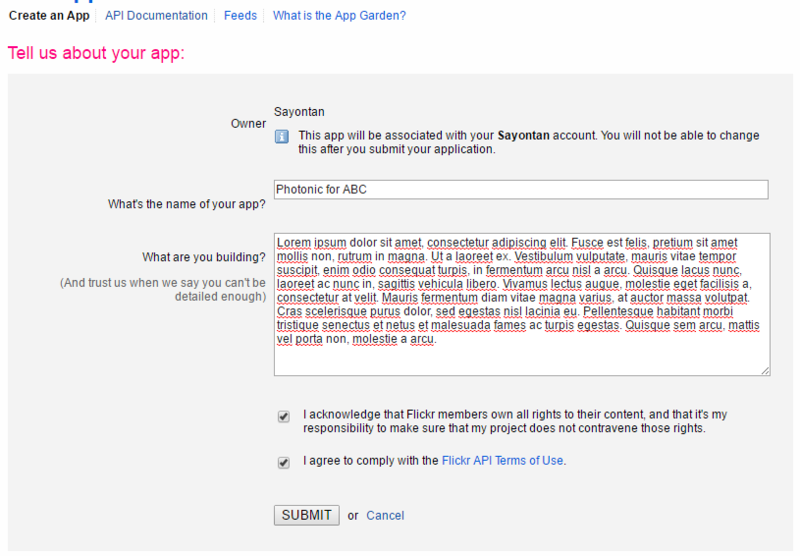 You are now ready to roll with Photonic for Flickr, now!